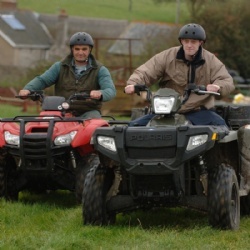 Hush Farms offers two All Terrain Vehicle (ATV) training courses in Devon, Dorset, Somerset and throughout the UK – both of which meet HSE requirements and are LANTRA accredited. NPTC assessments are also available. The Legal Bit: anyone operating an ATV or quad bike for work purposes must be provided with training in its safe use. Sadly, this isn't optional; whether you run a large organisation or you're self-employed, it’s a legal requirement. Whatever your business, we do our best to be flexible around your needs. Come to our place in East Devon for the ATV training, or we’ll come to you. Plus, we’ll fit the course around your schedule, whether that’s working around feeding time, or the kids’ school holidays. Just let us know what suits you. On average, two people die each year in ATV accidents. Non-fatal accidents are estimated at over 1,000 serious injuries per year. Our ATV training courses are almost entirely practical – in fact, just about the only bit of paperwork involved is signing your name on the forms. We also offer ATV refresher training for those who need to renew their qualifications. Objectives: Legislation; basic maintenance; design features; safe operation on roads, flat ground, slopes and rough terrain; carrying loads and trailed equipment. Trainees will need: A packed lunch and non-snag clothing appropriate to the weather conditions (with a minimum of long sleeves, long trousers and strong boots). We can provide extra PPE, or sit-astride ATV machines (quad bikes) at an additional cost, but you are welcome to use your own, if it is fit for purpose. 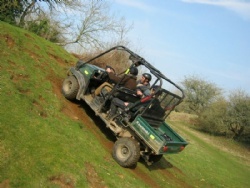 This one-day quad biking course assumes that all Trainees have reasonable prior ATV operating experience. The duration of this ATV training course varies depending on the number of people attending and assumes that Trainees have limited prior quad bike operating experience. This two-day ATV training course is suitable for groups with a varying range of ATV operating experience and levels of competence. Prices shown include LANTRA workbooks, registration and certification. NPTC assessments are available, please contact us for details. Trainees will need: A packed lunch and non-snag clothing appropriate to the weather conditions (with a minimum of long sleeves, long trousers and strong boots). We can provide extra PPE, or sit-in ATV machines at an additional cost, but you are welcome to use your own, if it is fit for purpose. 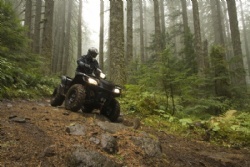 Our ATV courses can be tailored to all levels of ability and experience. Please note: minimum ATV course age is 17yrs.